Seniors with limited mobility often face challenges with their daily routines that must be addressed to keep them safe and happy. You can use the following tips to care for an aging loved one with mobility challenges while helping him or her maintain independence. Today, many seniors can continue to age in place with just a few simple renovations to their homes. For example, you can add grab bars to your loved one’s bathroom to prevent falls, or he or she may prefer a ramp instead of stairs at the entrance of the house. Seniors who live in two-story houses can install chair lifts to get up and down the stairs. Explore the different types of accessibility features available to find the ones that fit your loved one’s needs. Many older adults are choosing to age in place, and some need a helping hand to continue living at home safely and comfortably. Luckily, there is professional senior care Winnipeg seniors can trust and rely on. In addition to home upgrades, mobility aids help seniors overcome certain challenges that make it difficult for them to move around. Have your loved one try out different types of mobility aids to find one that fits his or her abilities. For example, your loved one may need a cane to provide more stability or a wheelchair to move around the home. The loss of mobility can make it difficult to complete even simple tasks such as getting dressed. While this may cause your loved one to get frustrated, you can keep him or her motivated by providing gentle encouragement. Make sure to let your loved one know that you notice his or her efforts. A little praise may be all it takes to encourage your loved one to keep trying to master a difficult task and maintain his or her independence. Living independently is important for seniors who want to maintain a high quality of life. For some, this simply means receiving help with tasks that have become more challenging to manage over time. Even when families have the best intentions, they may not have the time to provide the care their elderly loved ones need and deserve. 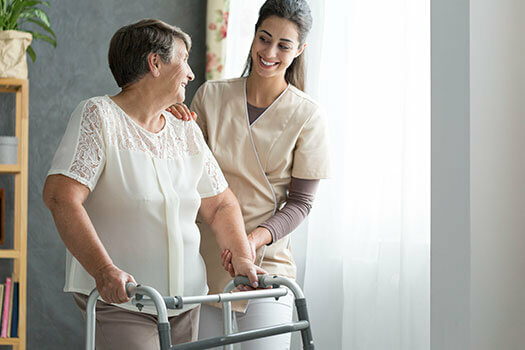 If your loved one needs help for a few hours a day or a few days a week, reach out to Winnipeg Home Care Assistance, a trusted provider of respite care Winnipeg seniors can depend on. Seniors with limited mobility can still accomplish many things if they are provided with enough time to work through each step. As you get to know your loved one’s habits, provide extra time for tasks such as preparing a meal or taking a bath. While it may not take as long as you anticipate, you can prevent your loved one from being rushed to complete a task. By making sure your loved one is not rushed, he or she may be willing to accomplish things independently. Fall prevention is a critical part of senior in-home care. Conduct a safety assessment of your loved one’s home to find potential hazards before they lead to injuries. If you are new to this type of assessment, recruit the help of a professional caregiver who is trained to recognize potential fall hazards. Then, remove dangers such as cords that stretch across the walkway so your loved one is free to move about the home without restrictions. Seniors who want to remain healthy as they age can benefit in a variety of ways when they receive professional home care. Winnipeg, MB, Home Care Assistance is here to help your loved one accomplish daily tasks, prevent illness, and focus on living a healthier and more fulfilling life. To create a customized in-home care plan for your elderly loved one, give us a call at (204) 489 6000 today.